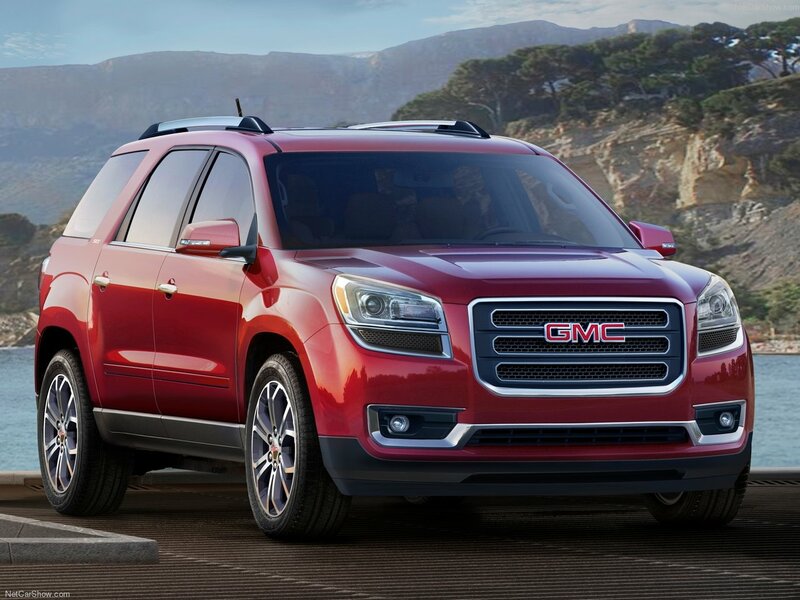 GMC has unveiled the refreshed version of their first crossover, the Acadia, at this year’s Chicago auto show, revealing a more aggressive granite inspired design. This Update, rather than being powertrain focused like it was previously rumored, is mostly styling related. Back in 2007 when GMC initially released the Acadia, it’s stablemate Saturn also launched a Lambda derived Vehicle called the outlook, which was phased out along with the Saturn brand in 2010, this left GMC with a crossover in need of an update, and the unused tooling for a very similar, yet cleaner looking SUV, who’s fender flairs always looked like they belonged on a GMC. And It appears that GM made an extremely brilliant decision to turn the Outlook into the new Acadia, GMC Designers updated the Outlook’s taillights, front fenders, hood, and front fascia to create the new Acadia. The Outlook’s styling blends very well with the new face, especially the wraparound rear window, and the fender flairs. The taillamps draw heavy inspiration from the Granite Concept, and look like they could be interchangeable with the Outlooks, so Saturn Owners could upgrade theirs if they wished. The front end is an attractive mix of the Denali XT Concept, the Terrain, and the Granite. The Styling is extremely polarizing, you either love it, or hate it, there really isn’t much in between. It’s got a very muscular and futuristic look, with an oversized three bar grille, a chrome bar running the length of the lower front that curves up around the lower inductions, which house projector style foglamps. the headlamps feature false(Running mascara style) vents, LEDs, and HID projectors. The car’s level hood features muscular angular sculpting. I Love that the Outlook is sort of in production again, But I’m sure GMC will take some heat for this and I don’t see why they made do with what they had, the outlook was a fine car, underappreciated, but still a good car, and so they made it better, It’s almost unrecognizable as an Outlook, and the original Acadia looked allot like an Outlook anyway. They already had the tooling so why not use it? It will save GMC from having to retool too much, and they still get the look they wanted. In a way what GMC has done is very American, they used what they had, and did not waste it. So think about it that way before attacking them.